A great opportunity for a company out in the Antelope Valley is seeking a Medical Office Manager to join their team! Seeking an outgoing, friendly, and personable candidate join their growing company today! A medical office manager, also know as health care office manager, is someone who is in charge of the overall business operations, whether in a large hospital facility, clinic or in this case a medical office. In this role the office manager may cover the front office, answering phones, assist with medical billing and coding, checking in patients and customer service. Having prior experience in medical setting and having been an office manager is preferred. If you have a go-getter personality and are great with building and maintaining lasting friendship with vendors and customers than this is the right job for you! We want you to love us so much you can’t wait to tell your friends! Our mission is to be the most referred administrative/office staffing firm in Santa Clarita and the Antelope Valley. We accomplish this by offering our candidates and clients a remarkable hiring experience. 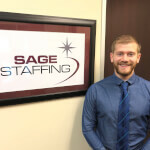 SAGE Staffing was founded in Santa Clarita in 1987, when we were one of the first locally owned and operated staffing firms to be established here. Our client list soon included some of the area's best organizations, such as Princess Cruises, Newhall Land and Farming, the City of Santa Clarita, U.S. Borax, Cal Arts and College of the Canyons. This solid foundation gave us the ability to expand into the Antelope Valley with a second office in Palmdale. SAGE is now trusted by over 2,500 companies in the Santa Clarita, Antelope and San Fernando Valleys. Candidates and clients throughout the area know they can rely on us for a remarkable hiring experience!